Representative Perzel established the Golden Apple program to highlight and recognize unique and ground-breaking education programs in Pennsylvania’s Public Schools. The awards are the first of their kind established by a state Speaker of the House, and any Pennsylvania public school, school district, area vocational technical school, charter school or intermediate unit seeking to recognize a program in any of the categories was eligible to apply. Winners were selected by review panels composed of experts in the five award categories of sciences, applied studies, arts an humanities, parental involvement, and administrative leadership. South Western was recognized for their Professional Learning Communities initiative. Based on the work of Rick DuFour professional learning communities are groups of educators with shared missions, visions, values, and goals, who focus their collaborative efforts on student learning. In a professional learning community, educators seek answers to three critical questions: What do we want students to know and be able to do? How will we know when each child has learned? What will we do when a child hasn’t learned? The South Western School District began their journey into professional learning communities during the 2004-05 school year. Through conference attendance and professional reading and dialogue, administrators learned about the potential of professional learning communities for improving student achievement and began to work within their schools. During regular meetings with their professional learning communities, teachers work to develop common assessments for the classes they teach, scoring assessment, discuss student results, and plan instruction needed to help students perform better on their classroom assessments. South Western School District was pleased to have been recognized for their administrative leadership. 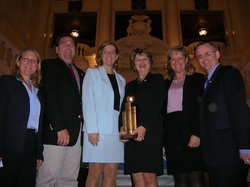 Pictured in the photograph are Manheim Principal Kris Strausbaugh, West Manheim Principal Tom Krout, Park Hills principal Mary Kay Kelly, Superintendent Barbara Rupp, Assistant Superintendent Barbara Kehr and high school principal Walt Graves.